One of the things that I’ve always wanted to construct is kinetic signage. People love to turn cranks and see stuff move. It’s fun and very satisfying. And signage is a perfect fit. Turn a crank, see something move, and associate a strong sense of enjoyment with the brand on the sign. What better way to start than with our own company! A Moveable Feast got featured on KCET’s program Socal Connected. The ~5 min feature aired on May 14, 2014 and it was quite an honor to have my art highlighted. It was great to meet the fun host, Nic Cha Kim, and see how the show is put together. Everyone at KCET was easy going and enjoyable to work with. I’m absolutely tickled pink that they selected me to be featured on their season opener. For those that are finding this blog from that site: Yes, A Moveable Feast IS for rent. I’ve brought it to weddings, parties, festivals, and just a small dinner party. Contact me at daniel.busby@gmail.com for more! 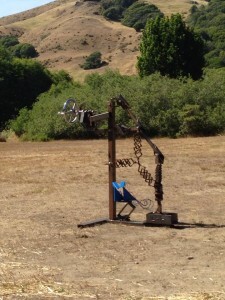 Bob Potts has alerted me that he’s installing his art at the M.A.D. Gallery in Geneva Switzerland. I’m sure it’s not easy to haul a bunch of delicate art pieces around the world. The M.A.D. Gallery included some great photos and a fantastic interview. Check it out! 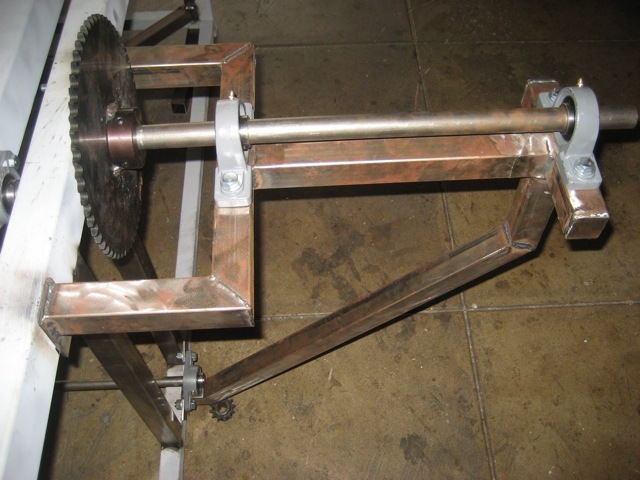 The whole point of building this tipping mechanism was to drive a ball through a maze. Now I had to actually build the maze. The first thing I had to do was to sketch it out by hand on graph paper. 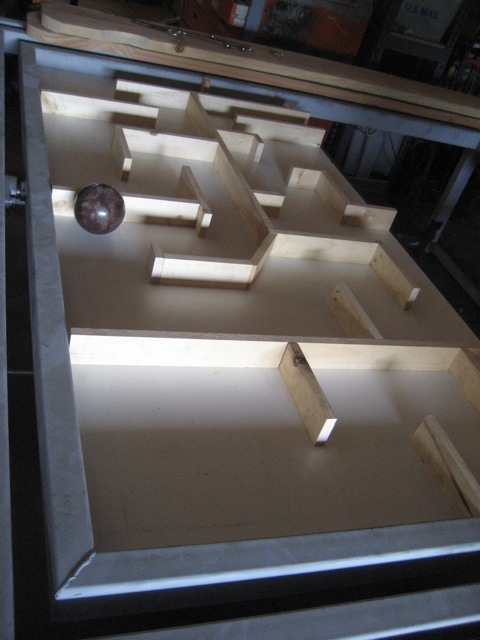 I had to account for the thickness of the boards, the width of the ball, and the path of the maze. The path I decided was intended to start easy, and get harder later in the maze. The goal was to build a learning curve into the maze path. I figured most people will require some time learning to use teamwork to solve the maze. 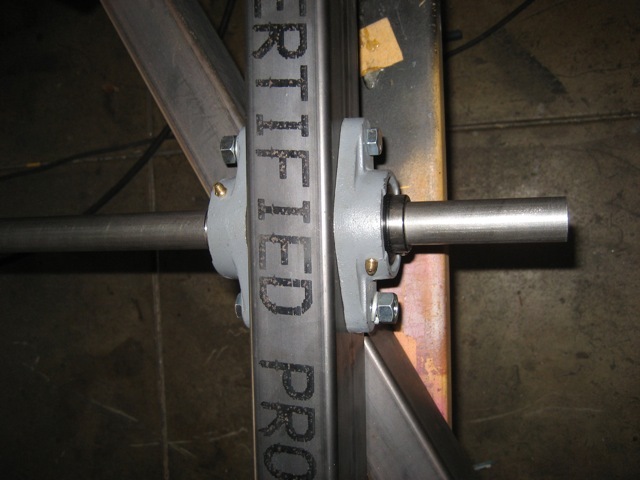 One of the most important tools a welder can have at his disposal is a decent welding table. In general you should have the biggest, flattest, sturdiest table you can muster. Of course, shop size can be a limiting factor. I decided to invest in a 4’x4′ table on wheels. We don’t do too much welding in our shop, so I don’t require too big of a table. I wanted the wheels so we can easily roll it around. Almost all of our workspaces are on wheels, so it’s pretty simple to change the layout of our workshop to make room for big projects, or roll everything out to clean. I drew up a quick napkin sketch of what I wanted the table to look like. I designed in a shelf for easy storage. This is a continuation of Part 1 of this series. 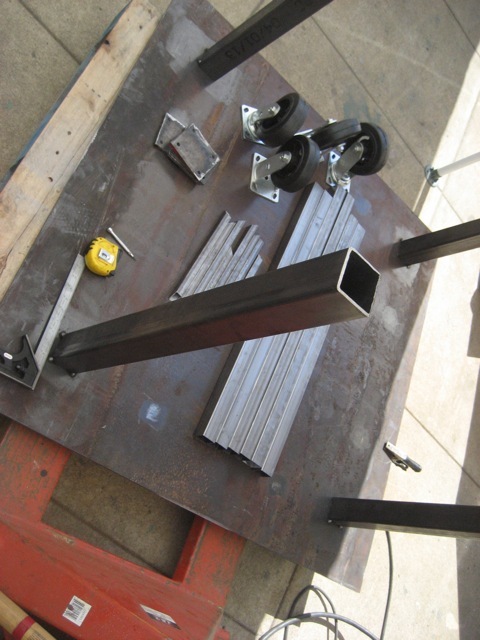 With all of the pieces cut, drilled, and welded to make the square frames of the labyrinth, it was time to start aligning the bearings that everything pivots on. I attached a pair of 1″ ID flange mount bearings to both sides of the holes. I left the bolts loose so I could let the exact position float a bit. Getting bearings aligned is a bit of an art, and it’s easier to wait until the last minute before tightening things down. I finally finished a large project. During the process I was intending to blog about the progress. Instead, I took photos and just let them build up. I’ve got enough photos that it makes sense to break them up into a few different posts. I hope you’ll bear with me. 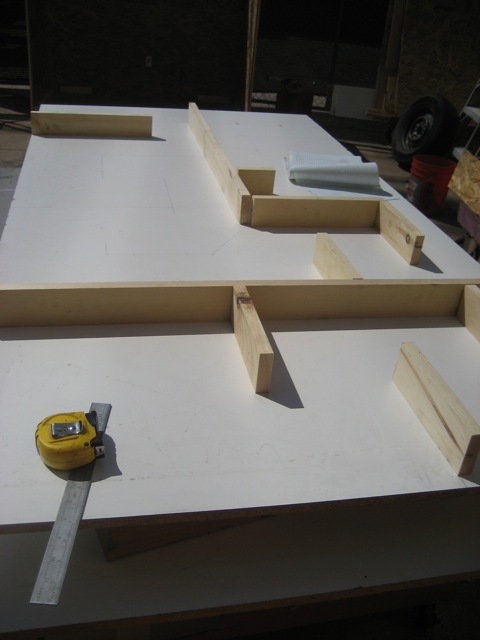 The goal was to build a large version of the classic wooden Labyrinth game. It’s always been a popular game, and it’s been copied many times, including digital versions for your iProduct. Bob Potts has just put out another fantastic video of his amazing art. Here is two of his pieces from 2012 and 2013: “Ascension” and “Synchronous Cycle”. I can watch this stuff on repeat for hours.